Anyway, this weekend B and I are hitting the road once again. This time, we're taking an eight-hour journey to New York state to celebrate his cousin's wedding. I love his family (and a good excuse to dress up) so I'm looking forward to the wedding brunch festivities :). Next weekend, though? I'm way too ready for something I like to call Sleep-Eat-Repeat. Really though, I'm the good kind of tired. That tired you get when you've been "Doing all the Things!" and exploring your face off. Frankly, it's a very lucky kind of tired and I truly have no room to complain. So, that said, I won't. I am so very grateful for life lately. Life is good! Life is real good! In the past 30 days, I've been lucky enough to explore three different cities: Austin. D.C., and Toronto. Yeah, I know. I live in Toronto so how does that count? Well, my friend, keep on reading and you'll find out the highlights of last weekend's touristy adventures :). Let's start at the beginning. 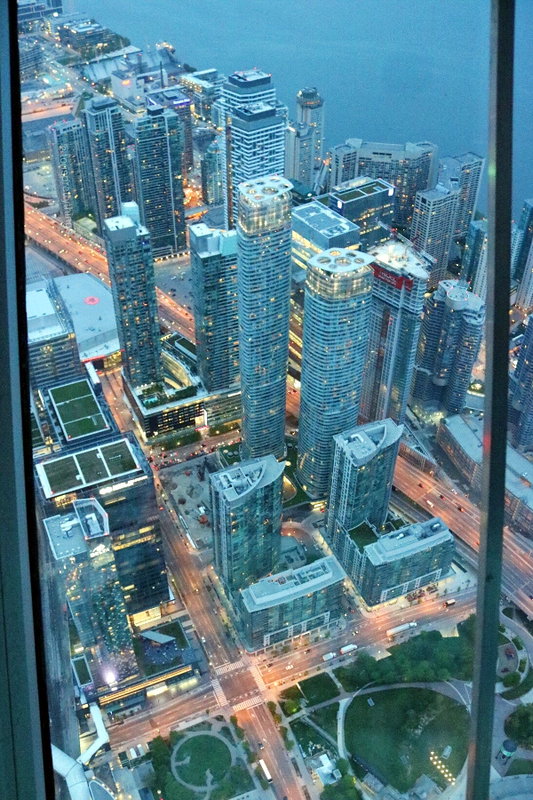 The whole reason we toured Toronto in the first place was thanks to our first visitors. Yay! One of our favorite couples made the trek across the border to spend Memorial Day weekend with us. I had the best time adventuring, exploring and doing some good ole quality bonding. Our adventure began Friday night with a simple dinner and plan of attack for the weekend. They suggested a Hop on Hop off bus tour, and B and I were all for it. When B and I lived in New York, we used to joke that one day our friends would be walking home from work to find us rolling down the street and bopping our heads on top of that red double-decker bus. So say no more - we were down! 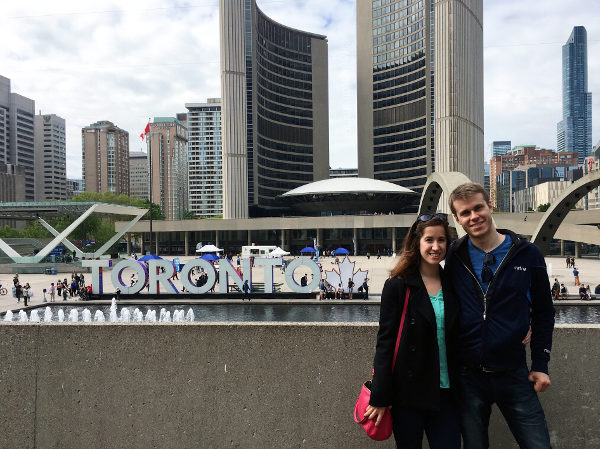 We caught the bus around noon, strolled up through Yorkville and hopped off at Casa Loma. You guys, did you know Toronto has a castle? It's not one of those super-old, 14th century relics or anything. Still, it's a castle and the closest I've come to one! 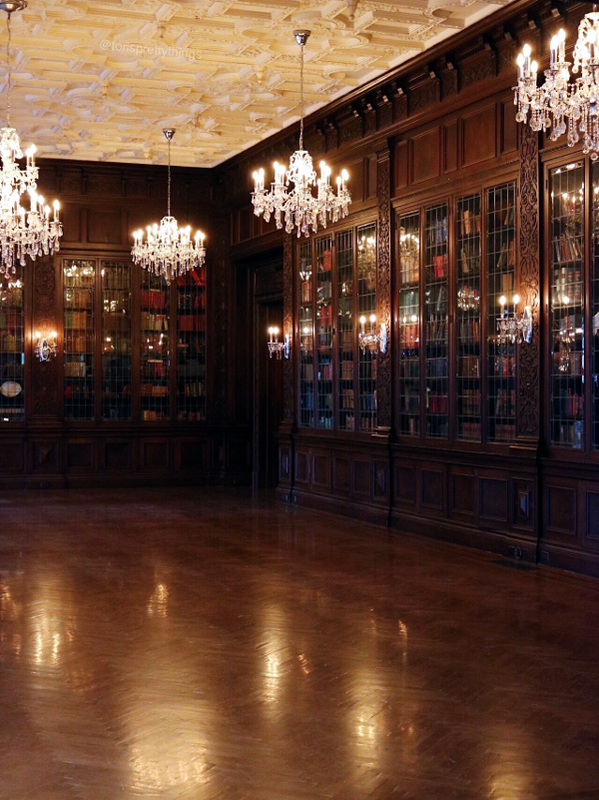 Touring Casa Loma wasn't part of our original plan but I'm SO happy we gave it a shot. This place was just absolutely stunning! Every inch was covered in elaborate detail and intricate architecture. It also didn't hurt that there was a wedding taking place in the atrium, further upping the awe factor :). 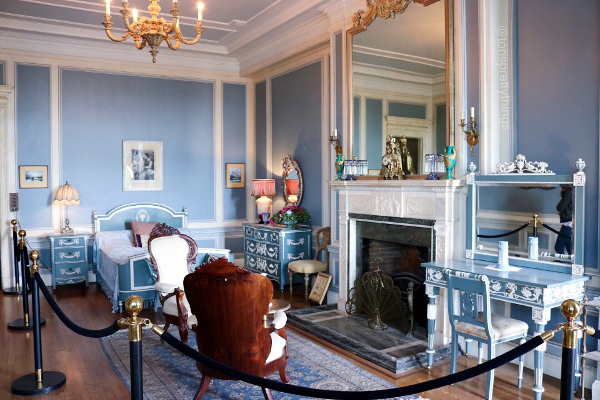 Of all 98 rooms, though, Mary Pellatt's bedroom was my favorite. Partly because it's decked out in my favorite color and partly because of the gorgeous feminine opulence. Ahh, what it must have been like to wake up in that room every day... :). 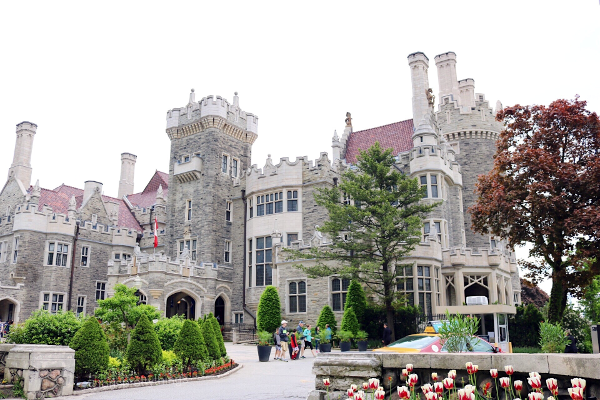 After a few hours wandering the halls, stables, and even underground tunnels of Casa Loma, we hopped back on the bus and finished the sightseeing tour. For breakfast, we chose a tried-and-true crowd pleaser with Eggspectations. It's an easy, yummy breakfast spot with something on the menu for everyone! Lunch? Honestly, we forgot to eat. Terrible, I know! We just wandered around Casa Loma for so long and wanted to make an early attempt to eat at Pai. So we snacked on a bit of trail mix. For dinner, though, we made and succeeded at that Pai attempt! Woot woot! Pai is known to pack 'em in, with an out-the-door wait pretty much every weekend. Somehow, the fates were on our side when we got there at 5 pm because we were sitting at a table in just under 20 minutes! Of course, you've got to be wondering - was the food worth the line? 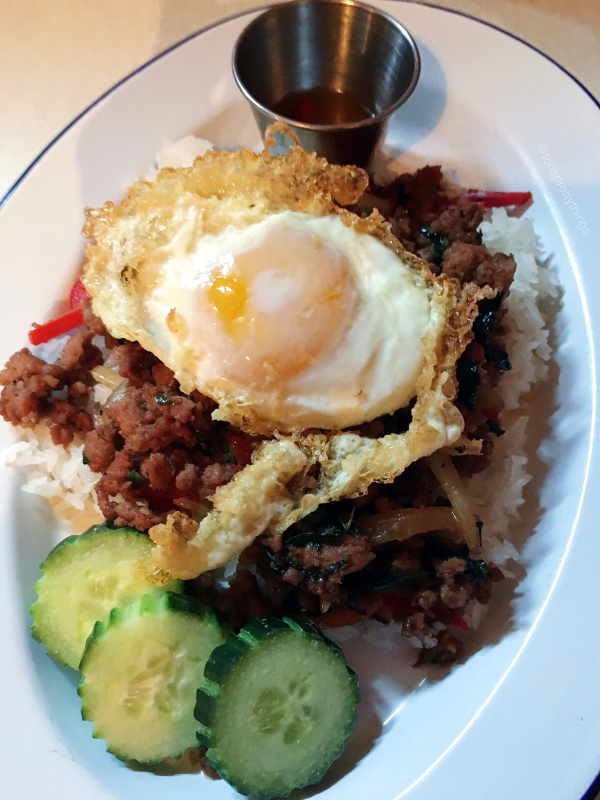 I'm not totally sure how I feel about Thai food just yet. I like it but I'm still finding my sea legs in this cuisine. Still, even I loved every bite of that dish above :). 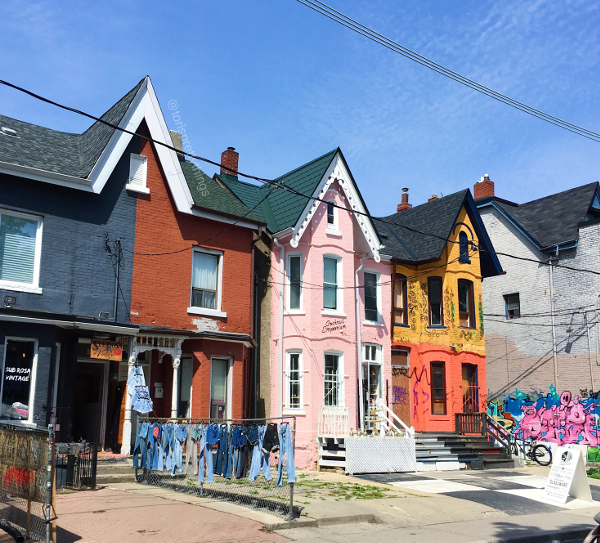 We knew from the start that Kensington Market would be a must-see during this weekend adventure. And our instinct was right - the bohemian feel and eclectic shops in this small neighborhood (that no, isn't actually a market) were a huge hit. It also just so happened that we stumbled into their first Pedestrian Sunday! So we enjoyed, even more, the sunshine, street art, and small-shop bustle as we wandered for a bit through these neighborhood streets. One of the best parts of the Hop On Hop Off bus tour is that your tickets are good for 48 hours (what. what?!). So we hopped back on to enjoy this super sunny day, take in all of the sites again, and catch a ride down to the Distillery District. 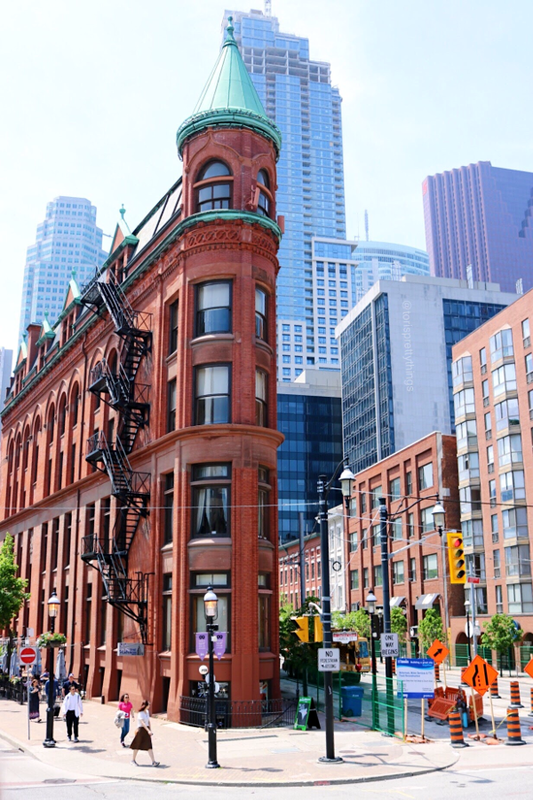 This day was quite a bit sunnier so we really enjoyed the beautiful views of Lake Ontario along with classic Toronto sights, like the original Flatiron building above. We spent the afternoon wandering the shops of the Distillery District (and dropping my jaw at the expensive price tags on some of that vintage-inspired clothing) and stuffing our faces with delicious lunch noms. 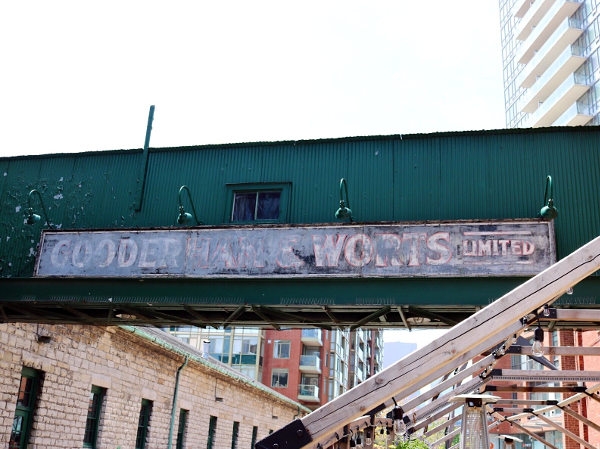 It was really nice to get to see Distillery District during the warmer months. B and I hurriedly saw the Toronto Christmas Market during our whirlwind trip last November. So it was nice to get a chance to really take in the district on its own :). 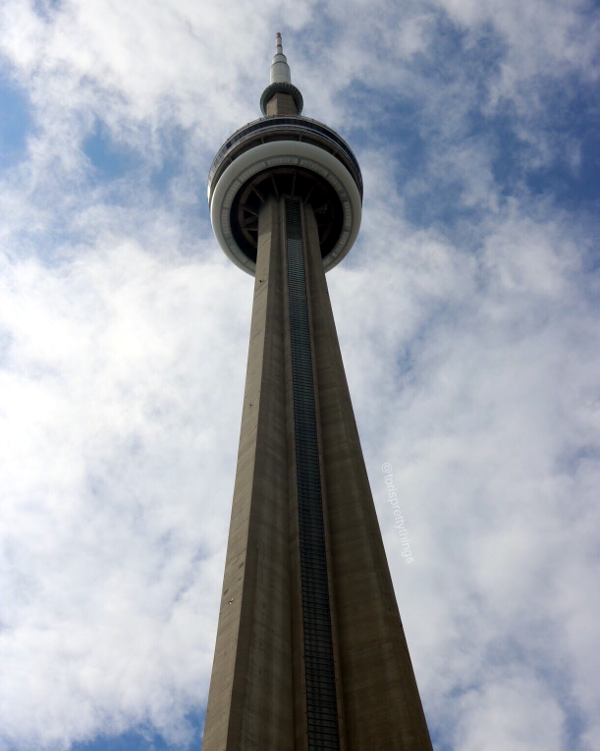 For the last sight of the weekend, we waited in a wayyyyy-too-long line to go up to the CN Tower lookout. I'm a sucker for a good viewing deck but that 85-minute wait to get up there was brutal! In all fairness, we were completely and thoroughly warned about that exact wait time when we bought our tickets. So we knew what we were in for but just didn't expect it to be so tiresome! That said, I would definitely recommend either picking an off-peak time to visit or planning to eat at the restaurant. Both would give you a better experience and less of a wait. Once we got up there, though, those views gave me all the heart eyes! Would you look at how high up we were?! While we missed our goal of catching the sunset, the dusk and nighttime views were still absolutely impeccable. 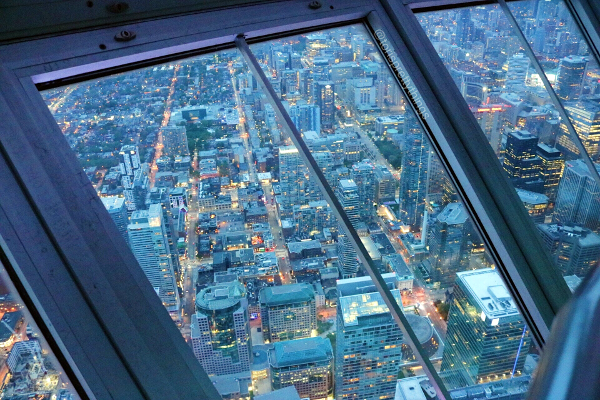 There's really nothing else like visiting one of the highest viewing platforms in the world. We started the day with one of the best egg breakfasts I've ever had at Bar Buca. 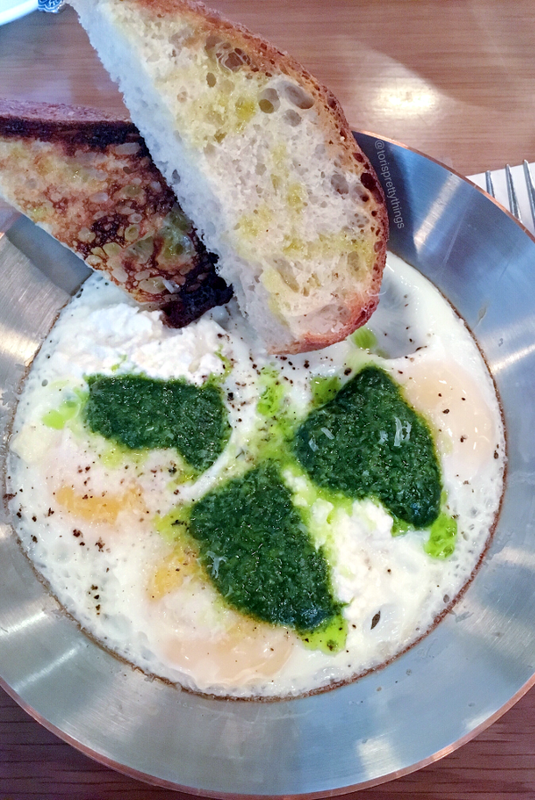 From a girl who's been know to eat ricotta cheese by the spoonful, let's just say I was in breakfast heaven :). For Lunch, we ate at the Millstreet Brewery in the Distillery District. Some of our dishes were hits (like the cauliflower dip and my Poke salad) and others were misses. Overall, it evened out to be a good lunch. After such a heavy lunch, we kept it super low-key for dinner and just noshed on the leftovers from our last couple of days. We did squeeze one dessert in when we each tried a decadent cone at Sweet Jesus to wrap up the weekend. And oh Jesus, was it goooddd! Phew! This post was a bit of a novel. So if you made it to the end? Thank you! You're a rockstar! All in all, we had a fantastic weekend and a blast being tourists with our good friends in this new city that we call home :).